ACT QUICK! ONLY VALID UNTIL 9/30/18! Tickets include admission to the entire museum! Go inside an actual Air Force One plane! View an exact replica of the Oval Office! May purchase up to eight tickets and additional as gifts! 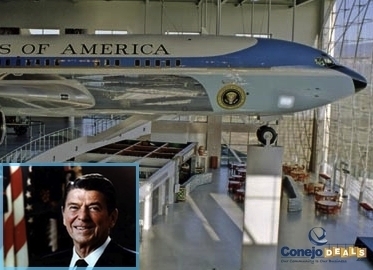 Everyone who lives in the Conejo Valley and surrounding areas falls into one of two camps where the Reagan Library is concerned. Camp One are those people who say, "I really want to get to the Reagan Library one of these days since it is in my own backyard and I hear it is amazing." Camp Two are individuals who HAVE been to the Reagan Library and say, "My visit to the Reagan Library was incredible. I would love to get back there someday." Rob and I fall into Camp Two: those who have been and can't wait to go back. And with today's incredible deal--just $17 for an adult ticket including the Audio Tour--the wait is officially over! Yes, you may purchase up to eight tickets per person and additional as gifts! P.S. Active military with ID and children 2 and under are free.